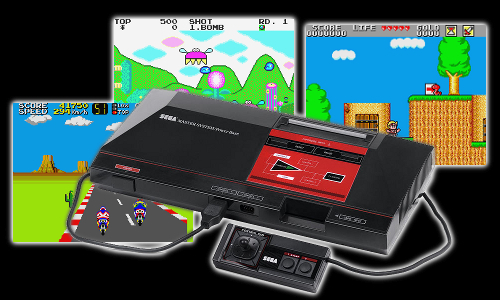 Sega's first American console, the Sega Master System (SMS) unsuccessfully attempted to compete with the NES (Nintendo Entertainment System) in the mid-80s. Although comparable to the NES in terms of graphic and sound capabilities (some would say superior), the SMS library of games was meager in comparison. Its subpar controllers didn't help matters either. With Nintendo dominating in America, the Master System was forced to compete with Atari for the remaining 10% or so of the home video game market share. However, the console performed much better on a worldwide basis, where it was supported until 1996. Console design: B. Streamlined and attractive, the Master System sports a slick black exterior with a burgundy label in front of the cartridge slot. This curious label contains an unnecessary diagram of the various system components (cartridge, controller, TV switch), as if a quick reference guide was even necessary. The only function it serves is to frame the power light. Cartridges plug straight down into the console, which is far more convenient than the NES front-loading scheme. A pause and reset button are situated in front of the cartridge slot. Placing the pause button on the console instead of the controllers was widely regarded as an awful design decision. The front of the console features a power button, two controller plugs, and a "game card" slot. It 1990, Sega released a second version of the console, featuring a more compact design but lacking a reset button and card slot. Console durability: A. With few moving parts, there's very little that can break on the Master System. Every one I've come across has functioned perfectly. Controllers: D+. 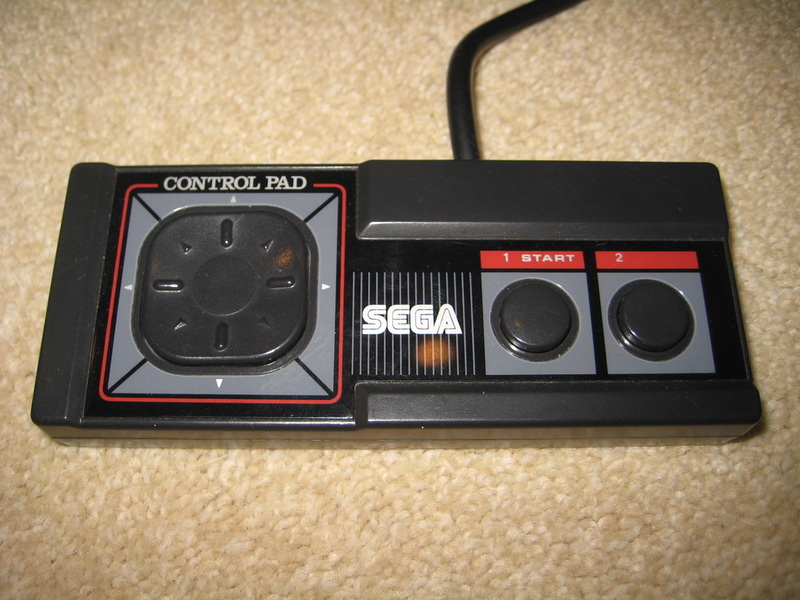 Wisely following Nintendo's lead, the Master System control pads are very similar to those for the NES in size and shape. Unfortunately, there are only two buttons, which is a limiting factor in some games. In addition, the directional pad has an inexact, "mushy" feel compared with the tight NES controller. Media: C-. Compared to the NES, the boxy SMS cartridges are extremely compact. Unfortunately, their tiny labels (which face forward, oddly), only allow enough room for the title of the game. One unusual aspect of the SMS is how it also supports game cards. The size of a credit card, these actually hold less data that a conventional cartridge, and were apparently designed to be a low-cost alternative to the more-expensive cartridge format. 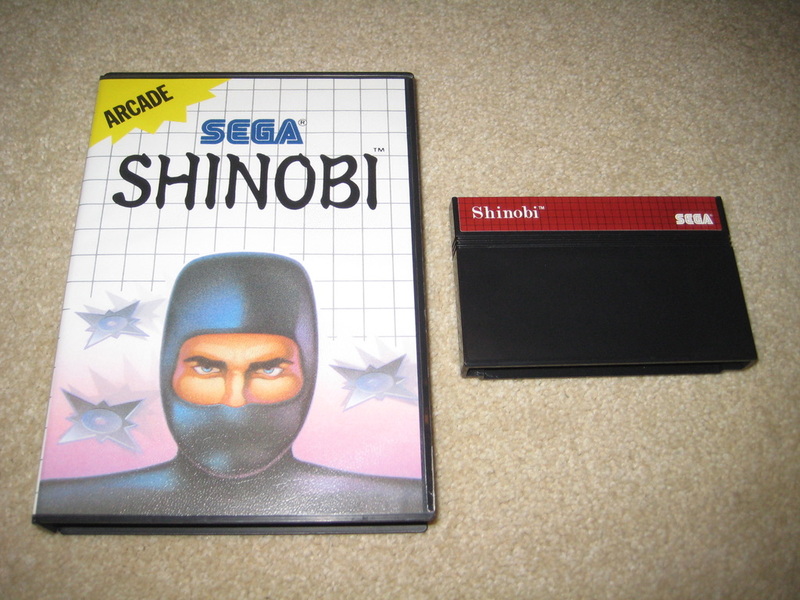 Only a few titles were released on card, and Sega eventually phased it out, re-releasing some card titles as cartridges. Packaging: C+. Starting a welcome trend, Master System games were the first sold in the classic plastic "clam" boxes. Very durable, presentable, and easy to snap open and close, this design proved ideal and would eventually be used to package Genesis games. The "card" games came in a slimer version of these boxes. Unfortunately, early SMS boxes tended to be white and plain, and the minimal "artwork" displayed on the front of many games was simply pathetic. It was as if Sega was trying to repel consumers. They later changed to a more stylish black design, but not until late in the system's lifecycle. Games: C. The SMS library is modest compared to the NES, and it lacks the cutting-edge titles. Worse yet, games that appeared on both systems were generally better on the NES. Sega especially stumbled in its "Great" sports series of games which were universally panned. Still, the SMS has more than its share of fun titles, including R-Type, Shinobi, Rastan, and the Alex Kid series (Sega's answer to Mario Bros). Even so, there are relatively few "must-have" titles. More sophisticated games like Sonic the Hedgehog, Ghouls and Ghosts, and Golden Axe were released late in the system's life cycle, but mainly outside of the US. Fortunately the Master system can play games from other regions; there's no problem playing PAL titles on a NTSC television. Of course, many of these titles were done better on the Genesis. Graphics: B. The SMS graphic capabilities may have been better than the Atari 7800, but side-by-side comparisons of games indicates that the NES may have had a slight edge in graphic quality. Like the NES, some SMS games are subject to slow-down, break-up, and flickering, but these problems tend to be intermittent and rarely ruin the action. Sega released a nice 3D glasses peripheral for the SMS. These glasses only work on certain games designed for it, but the illusion of 3D is quite convincing. Audio: C. Like the NES, the SMS was not particularly strong in the sound department. Voice samples were incorporated into some games, but they tend to be hard to understand. Collectability: C. SMS systems and controllers come relatively cheap, and most games are inexpensive and easy to find. Packaged in sturdy plastic cases, the games tend to be in good condition and include instructions. Some of the later titles were not widely available in America and may require some international shopping to track down. Overall, the lukewarm library of the SMS will mainly attract those who appreciated the system in its heyday. Innovations: Pause button on console, game cards, 3D glasses accessory.